What do a Dental Hygentist and a CFO have in common? They both love Chocolate. Thus starts the history of Sweet Divas Chocolates, a dream to produce the ultimate Chocolate temptations not only for themselves, but for the rest of the world to enjoy as well. Walt Disney once wrote "If you can Dream it, you can do it!". The Divas have proven Walt correct. Through patience and perserverance, Sweet Divas Chocolates was born. As the seed was cultivating, the need for more than Chocolate kept coming time and time again. They reached a point where they decided that they wanted all of life's little enjoyments under one roof. The menu and recipes expanded and the cabinets and drawers grew. Offering everything under the sun they enjoy, Sweet Divas Chocolates is not your run-of-the-mill Chocolate store. You'll find something here for every desire. This one-stop shop for goodies has been a real hit in St. Petersburg. We welcome you to come sample some of the delights. 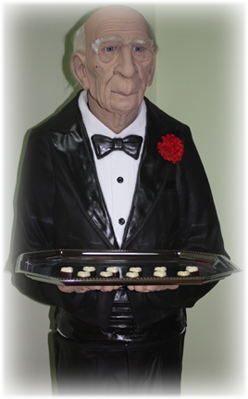 Dobson, our Greeter, will be pleased to serve you with samples. He's a little old and shakes when you near him, but he's never dropped anything yet. Get a picture with him for some memories. While you sit and enjoy your delights, you can use the tables inside, or enjoy the beautiful Florida weather and have them in the Bistro type seating outside overlooking Beach Drive and Tampa Bay.